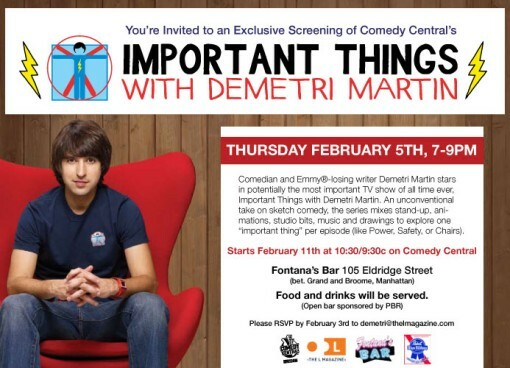 The L Magazine and Comedy Central invite you to an Exclusive Screening of Important Things With Demetri Martin, a new show on Comedy Central premiering Wednesday, February 11 at 10:30/9:30c. WHERE: Fontana’s, 105 Eldridge St. between Broome St. and Grand St.
Open bar sponsored by PBR and snacks! Please RSVP to Demetri@thelmagazine.com no later than February 3rd to reserve your space! Next Post Gordon Gano, The Lisps and Drink Up Buttercup at The Bell House Tonight!